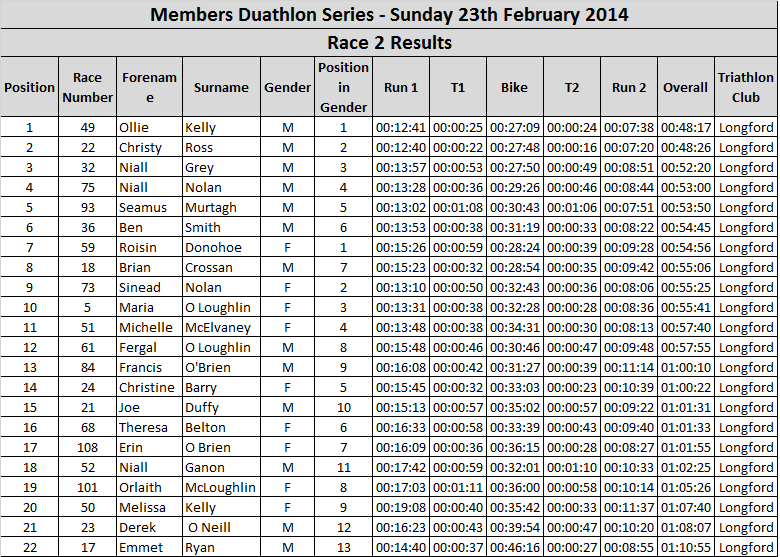 Congratulations on another very competitive race and well done to all those who took part in 2014 Race 2. Weather conditions were dry but blustery with a good turnout of 22 participants under the management of lead marshals Declan O Brien and Brendan Doyle and their crew of marshals. Christy Ross (Race 1 male winner) had a great time of 48:26 which was a huge improvement of 1 minute and 14 seconds on Christy's last time of 49:40, but this still wasn't enough to hold back Ollie Kelly who won with a margin of 9 seconds. Roisin Donohue (Race 1 female winner) did well again today battling blustery bike conditions to hold on to her first place slot in a time of 54:56 with a margin of 29 seconds on Sinead Nolan's time of 55:25.